New lawns are nice and green, here’s how to keep them that way! Here’s a very common new lawn mistake: giving it a honeymoon period. People often think that since new sod is green and free of weeds, they don’t have to maintain it for the first few weeks (much like a new car!) But it actually needs a little more TLC until it gets established. A freshly sodded lawn brings instant beauty to a home. But just because it’s green doesn’t mean it will stay that way. Keeping your lawn properly hydrated the first few weeks is essential to establishing a healthy root system that will require less water in the future. Even turf that is cultivated to be drought resistant still needs to be watered. With new sod, the roots are cut close to the surface. Encouraging them to grow deeper roots will help your lawn stay healthier because it will have greater access to moisture and nutrients. It will take at least five or six weeks for the root system to get established. As this is happening, it is important to water deeply two or three times a week. Test the soil with a screwdriver to ensure you’re getting the turf wet enough so that roots are drawn down deeper. You should be able to drive in the screwdriver easily. Be sure to test several locations, so that you can also confirm that the water is being distributed evenly. Other clues: If you see water running out from beneath the sod, the soil is fully saturated. If the edges of the sod are turning up, you may not be watering enough. Healthy, drought-resistant grass comes from having deep roots. To encourage deep root growth, water more thoroughly but less often. This encourages the plants to reach further down to find moisture. If you give your new lawn just a little sip at a time, the water evaporates quickly. The roots will stay toward the surface because that’s where the moisture is located. Surface watering also makes your lawn more susceptible to mildew and other fungal diseases. 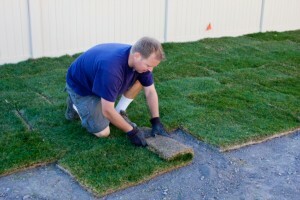 With deeper watering, new sod should be fairly well-rooted after the first month. After that, it’s ready for more foot traffic and play time. It’s also okay to start mowing, as necessary. Just don’t give it too close of a trim. Always remember to only take off the top one-third of the grass blades. So the bottom line for new sod installations is this… it’s not about the frequency. You don’t have to water morning, noon and night. It’s about providing the a good soaking to start the roots in search of deeper water sources. Once the roots are firmly in place, you will be able to water less, worry less and enjoy more!